This entry was posted in Art and tagged Bathroom, Class, Kaldi's, Lighting, Photography, Private, Ryan by Justin Scott. Bookmark the permalink. A theme! I like themes! I love a nice bathroom too. Great photos! I added the picture of the bathtub 🙂 That one was really rushed. New idea though. 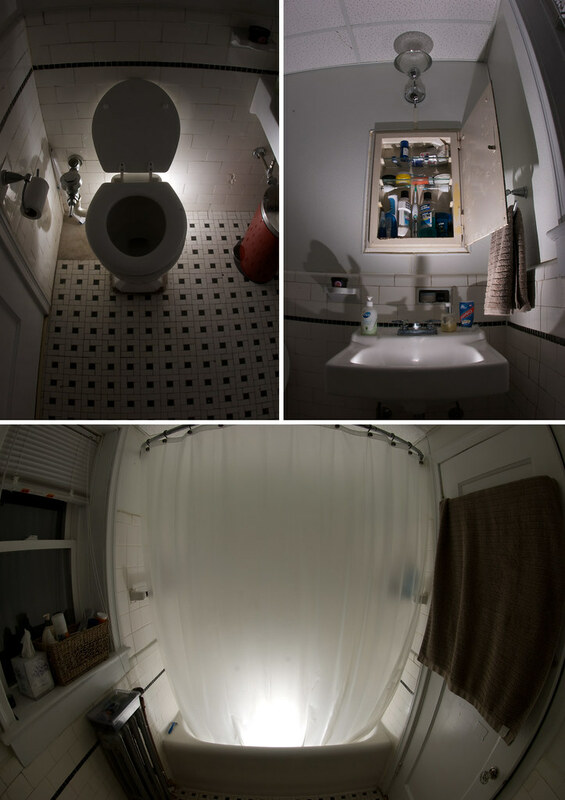 What if I took a pic of both the sink and the toilet at the same time and got the flash in both, two exposures, I think that would look really cool. These were all shot in total darkness until the flash went off, so framing and stuff gets to be really hard haha. If I could fit a tripod into the mix, that’d be one thing but just too small of a space. Ooh, okay, I’ve been thinking about this project some more. BTW, I like the newest proposed shot. For public I think a closed bathroom stall with super-cute shoes showing would be nice. Also, for private, I think you need a steamy shower with a lovely silhouette of the person showering behind the curtain or someone brushing their teeth with a slightly ajar medicine cabinet. Karens last blog post..What’s in a name? Damn! Karen beat me to it. I was thinking that putting someone in the shower would make for another great photo with the fisheye lens sometime.